Opposition puts Morsi "under siege"
A severe division is splitting Egyptian society since the decree issued by President Morsi two weeks ago. While many deplore the decree saying it would grant Morsi sweeping powers, supporters claim that the President would need these powers in order to sustain the situation in Egypt according to his duties as head of state. Both sides claim they were backed by the majority of people and announce to continue their protests. Last Tuesday, various opposition activists called for a huge demonstration from Tahrir Square towards the open area in front of the presidential palace where they set up their tents. Rising anti-Morsi signs and even writing their message on the Palace’ walls, they spent their night sleeping in the streets and the roads reaching the Palace square. The Muslim Brotherhood stated it was improper to cease the Presidential Palace with the aim of preventing the President from going in or out. They decided to break the blockade by force. Bloody clashes between opponents and supporters of Morsi followed. Protestors were attacked, their tents removed and barbed wire extended instead. Cars were burnt, riffle cartridges and guns were used on both sides; people attacked one another with knifes or branches of nearby trees, leaving at least seven people dead and more than 700 injured. Special Police Forces stood aside the scene, just occasionally filling the air with tear gas. As they kept on watching the street fighting, huge numbers of troops were in place and actually ready for interference but officials claimed that their task was to protect the Presidential Palace and that they didn’t have any order for interference. Critics later said that Morsi had missed a historic chance for compromise and that he was not acting as a President for the whole country but rather as a delegate for the Muslim Brotherhood. The growing tensions escalating in the latest clashes reveal deep divisions within the Muslim Brotherhood, which lead to resignation of four of Morsi’s advisers on Wednesday. On Thursday, Morsi appeared on state TV once more, confirming that the referendum on the new draft constitution would be held as planned. He underlined his refusal to back off the controversial edict he had issued last week but added that if the constitution was voted down, another constituent assembly would be formed to work out a new draft. 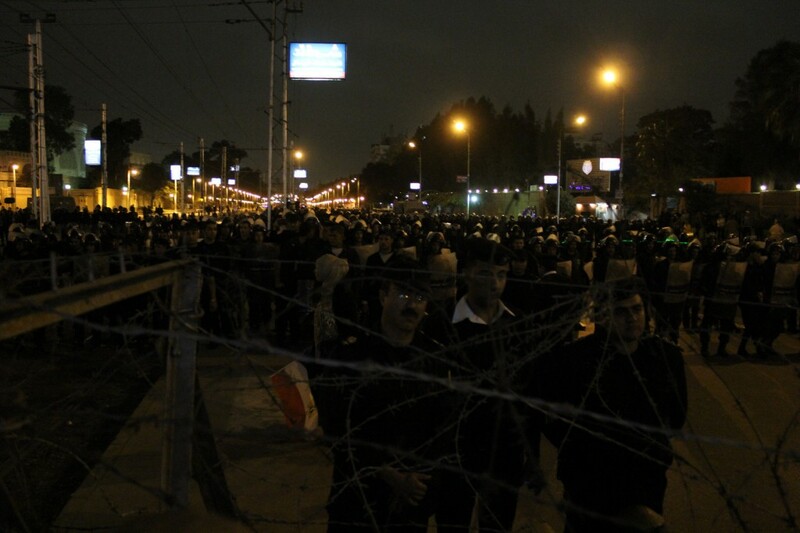 The Presidential Brigade first issued demonstrators outside the palace an ultimatum to withdraw but later resigned after protestors refused to leave. Today, Morsi demanded “assertive” powers. For this, Morsi pushed a charter that enshrines military’s power. Once again Egypt’s military stays in its key position. At the end of the his speech, the President invited all policital parties for a National Dialogue to be held on Saturday at the Presidential Palace. Yet, Morsi’s speech not only failed to mollify many protesters in the streets. Instead, it further enraged them as they already rejected calls for any form of National Dialogue. Activists camping in the square chanted “Leave! Leave! Leave!” as the president spoke. Right after the President had finished his speech, offices of the Muslims Brotherhood in Cairo and other major towns were attacked, some even set ablaze. The Police fired tear gas to disperse hundreds of protesters gathered outside the president’s house in his hometown of Zagazig, north of Cairo. Members of the opposition said the president had offered little in terms of concessions, criticizing his refusal to delay a constitutional referendum. Once more they accused Morsi of consolidating power in his hands and directing it towards the Muslim Brotherhood. Two other opposition groups, the liberal Wafd Party and the National Association for Change, according to state media reports said they would also boycott the dialogue. US President Barack Obama called on Morsi to express his “deep concern” over the recent violent protests. Obama welcomed Morsi’s call for dialogue, but stressed his offer should be “without preconditions”. Today, more protestors gathered at Tahrir in response to calls by the 6th April Movement, which played a prominent role in igniting last year’s revolt. Calliung for Morsi’s dismissal, the movement says it wants to show Morsi a “red card”. Marchers called for Morsi not merely to rescind his decree but to step down from presidency. The chant of the 2011 revolution – “The people want to bring down the regime” – was echoed in all streets. Meanwhile, thousands of protestors mobilized by the Muslim Brotherhood gathered outside Cairo’s prominent al-Azhar mosque for the funeral of members who had been killed in the clashes. “Our souls and blood, we sacrifice to Islam,” they chanted. Talk at the pro-Morsi demonstrations is that democracy means rule of majority – what they often forget are the rights of minorities (political, religious etc. ), journalists, workes and many others.